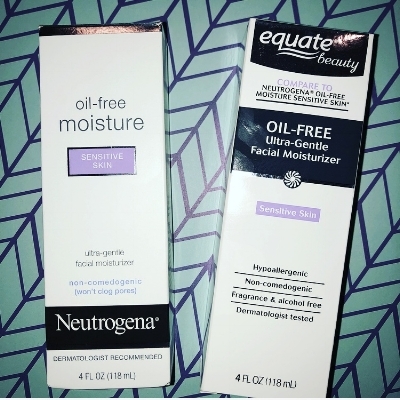 With a 99% similarity score, our faces will stay smooth and clear with the equate dupe of this Neutrogena lotion. We loved both equally! We recommend grabbing the equate version and saving some money. Brandefy compares off brands (e.g., Equate) to name brands (e.g., Neutrogena) to show you when the generic is as good as the name brand, and to warn you when it is not. Our purpose is to help you save time and money, and to have a good time while doing it. Skin gets dry this time of year, and it's important to take care of it. We heard a rumor that the equate version of Neutrogena's facial moisturizer for sensitive skin was almost identical. We found these rumors to be true! The consistency, smell, and after-feel were almost exactly the same. Additionally, the ingredient panels were nearly identical. We will be using the equate version this winter to keep our faces merry and bright!